New Affinity / Orlimar Golf Fastrax 460cc Series "Anti-Slice" Driver: Free Matching Head Cover!!! Bam!!! The same company that brings the orlimar golf clubs to the PGA pro's has designed the Fastrax anti-slice titanium driver for us..! Yes these are brand new! The manufacturer's suggested retail price for this item is $99.95, your price is much better!! 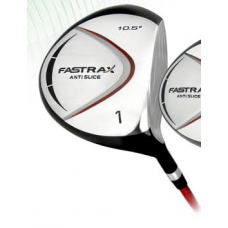 The affinity / orlimar "Fastrax series" graphite shaft driver is a great way to go if you are struggling with a slice! It's also a great way to go if you want to up-grade to the latest technology from an older style driver. The greatest challenge off the tee is to avoid "slicing" your shots. The offset head promotes better hand position and the "closed (3 degree) face" combine to keep you from "pushing" or hitting the dreaded "slice"!! 460cc over sized titanium matrix head for larger sweet spot and extra durability!! Back weighting: puts more momentum behind the ball for even more distance and accuracy! "Aldila (#1 in graphite shafts) extreme distance" technology high strength "advanced carbon fiber graphite shaft for more distance! 10.5 degree loft; "closed face"
As always we have had excellent feedback with affinity orlimar golf clubs. So it's time to lose the slice!! Affinity orlimar golf is headquartered here in Michigan and they've been around for a long time (even longer than we have)! We've been playing these golf clubs since we were kids and have been nothing but satisfied and we guarantee that you will be too!! We accept PayPal, Visa, MasterCard, Discover and American express on our secure network!